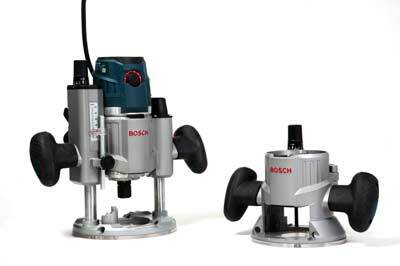 Bosch pioneered the idea of combining the advantages of fixed- and plunge- base routers with the GMF 1400CE, but early next year this will be superseded by the new GOF 1600CE, which incorporates several innovative features. The concept of a multi-function router is quite simple, with the same motor unit fitting into either a fixed base or plunge base. However, the problem with this setup is that the switch then has to be located on the motor unit, rather than on the router handles, so it remains relatively inaccessible. Bosch has overcome this very neatly with a low-voltage rail interface that allows a switch on each base to communicate with the motor unit. It is also impossible to start the motor unless it is fitted into either of the bases, and will not start if you slide the motor unit into a base with the switch already on. Two very bright LEDs in the motor housing are always lit when the machine is plugged in to give a useful reminder that it is 'live', and to provide some light to the working area. The constant electronic variable speed gives a range from 10,000-25,000rpm with the selector dial being well recessed into the casing to prevent accidental changing. The smooth start really is ultra smooth, making it a pleasure to use. 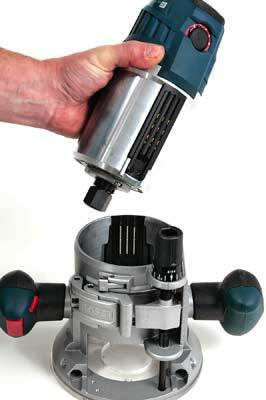 The motor just slides into the base in a tool-less operation, with a snap lock to secure it. However, you do have to press a safety button to allow the motor unit to be removed completely, a feature particularly relevant if the router is mounted under a table. 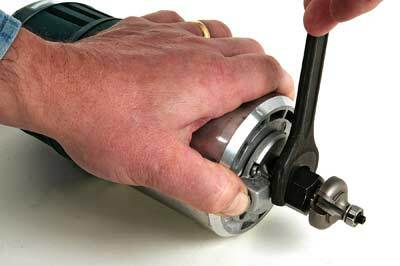 To me the biggest advantage of the removable base is the clear access you then get to change the cutter, and with the spring-loaded spindle lock you need only one spanner. 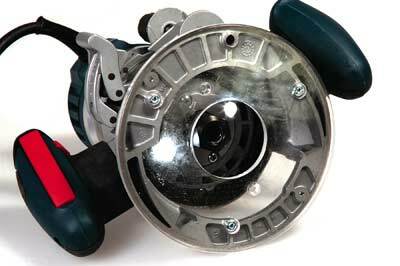 Another neat feature is the ball & socket attachment of the cable into the motor housing which allows you to adjust it to the most convenient angle. Both bases have large openings to afford better vision of the cutter, and are further enhanced by the plastic sub base that maximises the support without obscuring your view. On the plunge base, the lock is what I call the 'positive' type in that you simply have to release the lever, push down to the correct cutting height and then release it for it to lock automatically, which I find far easier than pushing down and then having to lock manually. The set up for depth control appears to be fairly standard with a depth stop rod operating onto a multi-position turret. 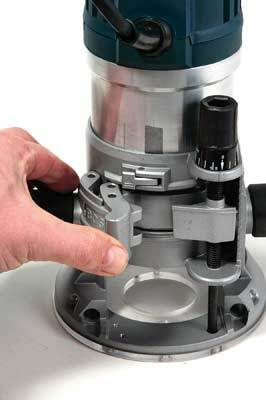 Fine-depth control is provided by a built-in adjuster, which has true micrometer-style adjustment that can still be used after the plunge has been locked. 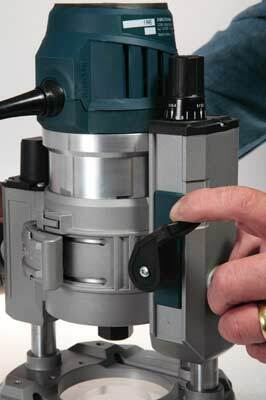 This - after lock - fine adjustment is unique to Bosch and allows precise adjustment of the bit position. One full turn of the adjustment knob equals 1.5mm but it is graduated in 0.1mm increments. More importantly, the fine adjustment has a total range of 16mm, so you have plenty to go at. The fixed base has a similar arrangement for fine adjustment, with three horizontal notches on both sides of the motor housing for quick operation. There is also the facility to operate the fine adjustment through a hole in the base if you are using the router upside down under a table. Fitting guidebushes into the base of a router is always a fiddly job, but on the GOF 1600 a neat SDS system allows them to be changed and locked in position without the use of any tools. If you look carefully the plastic sub base extends slightly beyond the cast base. 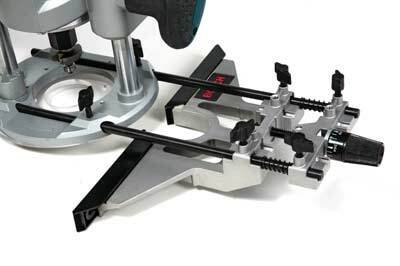 This is a deliberate feature as it is far more accurate and therefore produces guaranteed centring of the cutter when working with the base against a guide rail. 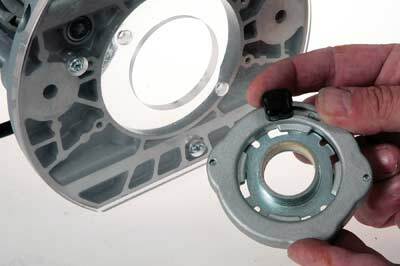 The sub-base can be re-aligned if necessary with the centring device provided. Dust extraction is reasonably well catered for, although it is never easy on a router and it is all a bit fiddly to set up. A standard extraction hood fits into the base with two knurled knobs, but you are also provided with a side collection extraction hood that screws on underneath the base, a more efficient option for edge moulding. A standard side fence incorporating fine adjustment is also included and this fits either of the bases. My understanding is that the GOF 1600 will be sold in three variations. The first is the whole unit as tested including both bases in an L-box. The second option is the motor unit with plunge base only in an L-box and thirdly you will be able to buy the fixed base only. 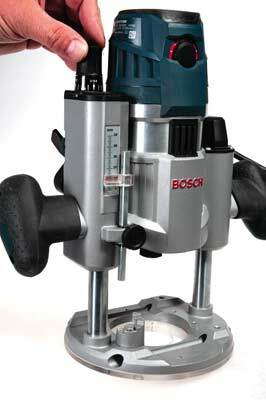 Although I usually use a plunge base router I have always been keen on a fixed-base version for certain applications. This tool gives you the best of both worlds with some unique features that have to be used to be fully appreciated, but combine to make the GOF 1600CE very user friendly. 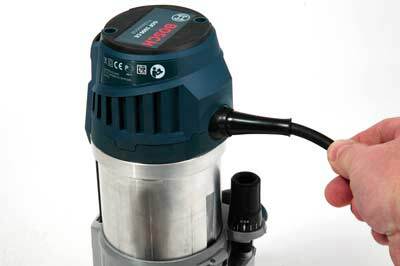 The 1600W motor provides plenty of power, even for demanding cuts. The extra support provided by the transparent sub base makes it more stable, particularly on narrow workpieces, and the ease of changing guidebushes ensures template work is a doddle. 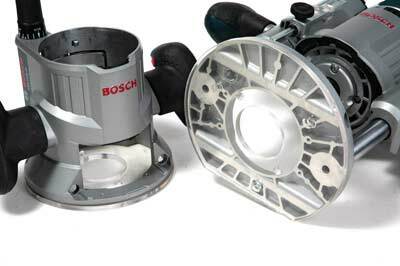 For sheer versatility and features this router from Bosch will be very hard to beat in the mid power range.